Getting rid of biofilm and limescale in the heating bundle. Some factors cannot be directly influenced when using a heat exchanger. These are the equipment (plate or tube) itself, the type of liquid, the location of the heat exchanger in the circuit, the temperatures of the liquids. All this has a significant influence on the cycles of how often the heat exchanger needs to be cleaned. Important for us at Merus are the parameters that can be influenced. The focus is on the solubility of substances in the fluids flush through all equipment. Salts are usually soluble in a liquid, but sand, mud or sludge are not. 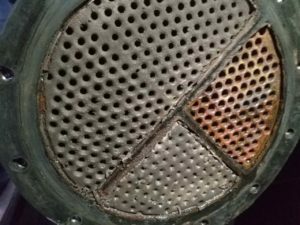 A clean heat exchanger requires no cleaning ! To treat only one heat exchanger, we install a Merus ring in the inlet of the side to be treated. Sometimes we even install on both sides, the tube side and the shell side. In this way, we have significantly better performance in critical applications. In a marine installation, be it on a boat, a ship or an offshore platform, the highest requirements are placed on Merus rings. The raw water is seawater holding salt and calcium causing fouling, corrosion and beyond that even sea life, like barnacles or mussels. We have a cases in fresh water generator, which is a modified Plate Heat Exchanger. First we have remove the existing scale, flush it out togehter with the brine. And since then the equipment stays clean, no chemical cleaning required anymore. In effect foreign substances in the water will settle far less, usual there are flushed through the heat exchanger tubes without forming deposits. Thus the surfaces stay clean and biofilm, bacteria and other organisms can't stick to the inner pipes. This means that blocked tubes as showed in the picture are not an issue anymore. The intervals between cleaning are considerably longer. And the heat exchanger cleaning is very easy as there are no hard crusts in the tubes. The maintenance can in a lot of cases be reduced from once a month to once a quarter or even once a year. At less demanding installations for instance when we treat water which feeds the equipment. It is even possible to treat with only one Merus Ring a whole group of Heat Exchangers. We install the ring where the line branches out or behind a pump and can treat this way 5 or 10 consumers. The side effects of a cleaner system are enormus. If there is no fouling there is less resistence in the flow. Means the pumps needs less energy. Less frequent cleaning means less repair work on bended plates of a plate exchanger. Lesser opening the equipment for cleaning means less seals to be replaced. All together a big saving. Over 20 long years we are improving the efficiency of heat exchanger cleaning. We keep of course track of the improvements. Some of the used data are from the evaluation period after the installation. Majority of the data are from big projects, where we are until today regularily in contact with the customer and control the situation at the heat exchanger. Using parameters such as the pressure drop (delta P) or the heattransfer. In the table below you see the approximate result of heat exchangers, where we are treating the water side. These results where achieved in a system where the cooling water had not more than 3000 TDS. Also the substances causing the fouling are soluble in the water. Nevertheless a high TDS is not working against the Merus Technology. We will discuss the expected results with the customer before the installation. To get control of Biofouling, it might not be enough to treat only the heat exchanger. One have to look on the cooling system as a whole. If we provide treating of the product side, things are far more difficult. See also fouling in an oil application. Heating and Cooling are often connected and therefore should not be treated as separate systems. Where one medium (water, air) is heated up, the other one is cooled down in the same process step. With the Merus Technology we treat water, not the devices. Therefore the connection between heat exchanger and cooling (tower) for example in an air condition can be important to detect and locate the problem. If the cooling tower is full of algae and biofilm this can be a hint that there might also be a problem in the heat exchanger.